And while I hear about a lot of new electronics ahead of public announcements — because the manufacturers hope to see them appear in magazines at the same time they’re introduced — VoyagePlanner is all new to me. And interesting! 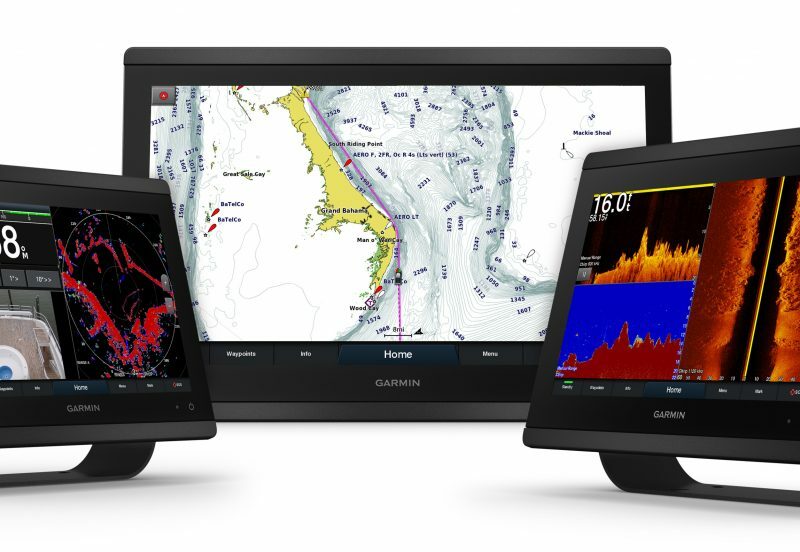 Apparently it won’t be out until spring, but it looks like a powerful planning program with “instant on-the-fly SeaTalkHS or WiFi sync of waypoints and routes” with your Raymarine MFDs. Sounds like another reason all the new e and c Series MFDs have built-in WiFi (and Bluetooth). I may have missed other new Ray gear in the brochure or on the UK site, but trust that Panbots will find it. And I hope you’ll share your thoughts on all the new gear already mentioned here. Ray’s on a roll. So what details should I be looking for when I attend the US launch in Miami? I don’t see the feature mentioned in the literature but I do notice that all these new MFDs have an Auto/Standby button, which implies built-in autopilot control perhaps as complete as what Simrad offers now. I have to believe that Raymarine closest resembles a Phoenix. This is a company that truly WAS on the brink of bankruptcy. A leader in many ways, especially when it comes to it’s longevity. But to read the new brochure, makes me glad to know that it is owned by an American Company that knows what people want! What a rebirth. Any info on the seatalk to seatalk bridge that’s mentioned to be available in spring 2012. I have old raymarine analog traducers on a ST60 system and would like to upgrade to i70 displays without upgrading the speed, depth and wind transducers. 1. The i70 can already take data directly from your ST60 system using an ST-to-STng patch cable (that comes with the i70, I think). I tried this recently with a complete set of ST40 transducers and displays, and the i70 showed the data fine, though it does not bridge the data onto the STNG/N2K backbone for use by other displays. Bottom line: there are a lot of working SeaTalk display and transducer systems out there, and Raymarine has come up with many ways to use some or all a system with the new STng instruments and MFDs. Great new units and all but I for one cannot believe that the new “chirp” fishfinder unit (CP450C) is NOT compatible with the E and C wides. The wides are less than 3 years old! Maybe they’ll make another “chirp” for the wides? What are the chances that these units will have a conventional N2K connection on the back so we don’t have to play with NG > N2K changeouts? Website info doesn’t look promising along those lines. The e7 has a Raymarine STng output on the back, not a DeviceNet screw connector. However, the manual does have a list of NMEA 2000 PGNs supported. Also note that Raymarine is using a new Ethernet connector on the e7 and probably all the new MFDs. It looks strong and fairly easy to fish, but adapter cables will be needed to network with older Raymarine gear that can integrate. I’m trying to figure out the “refit” options. How are they able to “shrink” the width of the unit to fit the form factor of the C80/E80???? Adam, I suspect the confusion is because there’s a difference between the specified outside dimensions with normal bezel and the cut out dimensions. Sure looks to me like the R70010 kit will let you put an e9 in the same hole your C80 now occupies, though the new bezel is quite wide at top and bottom and skinny at the ends. In the link listed above ( http://raymarine.co.uk/view/?id=2863 ) it is clear, at least in my mind, that the newer “look” of the RayMarine MFDs has been cheapened versus the more rugged Furuno-like appearance of the older e models. It’s similar to when autos years ago switched from real chrome to that hedious lookalike chrome plastic. I suppose others will be able to point out advantages of the new plastic design, but they look like they’re less likely to hold up in the marine environment. Jeff, pretty much the only difference between the E-Series bezel and the e-Series bezel is that Raymarine went from gray plastic to “chrome” and black plastic. The Furuno NavNet 3D also has a plastic bezel, dark gray. It really doesn’t matter as the bezels have nothing to do with the structure or waterproofness of the electronics; they are just trim. Great to see Raymarine has done it again, loved the E7 & i70 products when they where launched, so refreshing in looks. A really turning point for Raymarine and the whole marine electronic market. I was waiting for the bigger units and they look the business. I was thinking of getting the e7 but was waiting to see the 9″ but I would love the 12″. It would be a bit over kill for my needs. Well done Raymarine, please keep them coming!! These chartplotters look great. I was about to pull the trigger on an e7 setup, but now I’ll wait. The C series looks good, since I don’t feel like I need to pay the extra $ for touchscreen, especially when it’s not multitouch. Does anyone know about pricing and availability? They sure manage to create a lot of buzz. But I’m disappointed by the still low display resolutions, especially in the 9″ model (same 800×480 as the 7″). And unless they put a significantly faster CPU in the newer models, the touch interface is too sluggish. A very promising direction is the screen sharing option to an iPad. Of course it would have to be remote-controllable that way to be really cool. Has anyone compared power consumption of the old and new devices? It’s not clear to me what the difference is between the e125 model and the e127. Any suggestions? Thanks for the prices, Chris. These seem high to me, though, relative to the e7. Isn’t the e97 just a 2″ larger version of the e7? Are there any other new or different features? I appreciate having more screen real estate, but that seems like a fairly large premium to pay for it. I wanting to find some more images of the e9 & e7, I wanted to get an understanding of the rear connection area and bracket mount between the two models. Have been trawling the net and came across the design company who seemed to do all the design for Raymarine. Theres some nice views of the rear etc. I understand there most likely development photo’s but it gives you a good idea. On another note I never realize the effort companies go to to make new products. I’m surprised and disappointed to not find any news regarding Tacktick’s product line in Raymarine’s 2012 Product Brochure. Olaf, there are four pages of TackTick gear starting on page 28 of the brochure. I don’t see any changes in the line but it certainly didn’t go away. And nice find, Graham! I notice CWD also has photo galleries for other Ray projects like the RCU-3 remote, the i70, and even the new sun covers, sometimes including the elaborate prototyping process. I’ve seen similarly intense design work behind the scenes at Garmin and Simrad, and am sure it happens elsewhere. It does help explain the expense of developing dedicated marine electronics. Love the refit hardware option that allows an easy transition from a classic e80. Not sure if this was known to be coming soon? The latest version of the E9 (e7, etc) software talks about support for Rayviewer AND Raycontrol! The French web page also says it is “coming soon”. I imagine real soon with the software update. Installed RayControl today on my Samsung Galaxy Tab, updated e7 software to 3.15 and it works ok.
I’m having problems getting any of the Raymarine Android apps to run, but RayRemote and RayControl made it to the Apple apps store yesterday and the latter is working very nicely on my iPad 1 right now. More on Monday. I got it running on my iPad as well. Extremely easy upgrade and app works as expected. My only wish is I could have the e9 on my boats wifi network instead of having to switch my iPad when I want to use it.